Dorrigo National Park - The best things to do on a day trip! Home » Destinations » Australia » Dorrigo National Park – The best things to do on a day trip! Dorrigo National Park – The best things to do on a day trip! Dorrigo National Park is a slice of Australian paradise, found outside of Coffs Harbour on the mid-North Coast of Australia. Located within a world heritage listed forest, Dorrigo National Park offers visitors breathtaking views, an abundance of native birds and a wildly diverse range of sub-tropical vegetation. Not to mention the abundance of impressive waterfalls that have visitors travelling for hours to enjoy. I grew up on the mid-north coast of NSW, Australia, so spent many weekends exploring Dorrigo National Park. 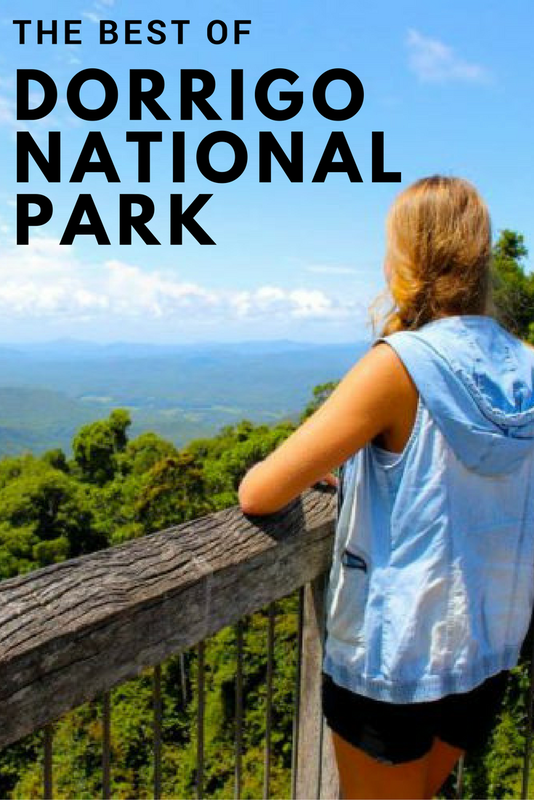 Having spent a lot of time exploring Dorrigo, I have put together a list of the best things to do in Dorrigo National Park on a day trip. Dorrigo National Park is a great day trip from Coffs Harbour. You can relax at a scenic picnic and barbecue spots, explore secret waterfalls, hike through the rainforest and visit the Dorrigo Rainforest Centre for amazing views. Below are all the best things to do in Dorrigo National Park. Dorrigo Rainforest centre is the ultimate place to start your visit to Dorrigo National Park. The Dorrigo Rainforest Centre can provide great tips and advice on what to do and see, including which walking tracks will best suit your needs. I recommend starting the day at the Dorrigo Skyway (near the rainforest centre), an elevated walkway through and above the treetops. From here you can choose between a number of Dorrigo National Park walking trails of varying lengths. I suggest doing the Crystal Shower Falls walk. The trail to Crystal Shower Falls will take you through the luscious Dorrigo rainforest, across a suspension bridge and down to the impressive waterfall and swimming hole. You can even walk behind Crystal Shower Falls. You can take a shorter hike to the falls and return the same way you came, or you can do a loop of the Dorrigo rainforest. I suggest taking the Dorrigo National Park loop trail, which is around 6kms long. If you take the loop you will also pass another Dorrigo waterfall.. below. You will end the loop at the Dorrigo Rainforest centre, where you started the hike. You CAN NOT go to Dorrigo and not see Dangar Falls. Dangar Falls is an impressive cascade waterfall, pictured below. From the car park you are a few footsteps away from a Dangar Falls viewing deck, BBQ areas and kids park. The trail to the base of Danger falls takes 10-20 minutes one way. On a nice day, you can swim at the base of the falls, and can even swim behind the gushing waterfall. Dorrigo National Park is a one hour drive from Coffs Harbour. Within an hour of driving, you will be in a completely different world, one filled with ancient rainforest, beautiful waterfalls and hundreds of native bird species. The drive from Coffs Harbour to Dorrigo is beautiful in itself. If you see any lookouts or viewpoints on the way to Dorrigo National Park, make sure you stop in. To get to Dorrigo National Park, follow Google Maps. I suggest starting your day in Dorrigo National Park at the visitor centre, which is pinpointed below. If you are in the Coffs Harbour / Dorrigo area, I highly recommend Whitewater rafting on the Nymboida River on your trip. Stop in at the quaint town of Bellingen on your way to or home from Dorrigo National Park. Grab a coffee or lunch and take a walk around. Bellingen is loved by all. If you take rubbish into Dorrigo National Park, make sure you take it home with you. The area is known to have snakes, so do keep an eye on the ground. Pack a picnic to enjoy in the National Park. 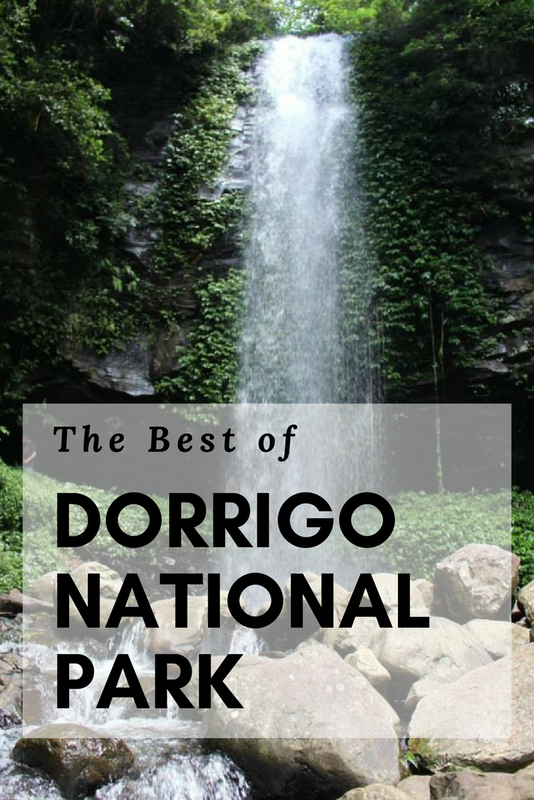 If you found this guide to visiting Dorrigo National Park helpful, pin it for later! Disclosure: This post on things to do in Dorrigo National Park may contain affiliate links.